Professor of Anatomy and Forensic Anthropology Dame Sue Black has won the coveted 2018 Saltire Book of the Year award for a non-fiction book that explores the many faces of death as experienced through her more than three decades’ career in forensic science – a career which has taken her from investigating the scene of horrific war crimes committed in Kosovo to identifying victims of the 2004 Indian Ocean tsunami in Thailand. Making their selection, the judges described the book as “curiously uplifting and life-affirming” and commented that “like all good memoirs”, it “reveals as much about the reader as the writer”. Now firmly established as Scotland’s most prestigious annual book awards, the Saltire Literary Awards are supported by Creative Scotland and celebrate literary and academic excellence across six distinct Award categories. The winner of each individual book award wins a £2,000 cash prize and goes forward to be considered for the Saltire Book of the Year award and an accompanying cash prize of £6,000. Dame Sue Black collected both awards at a special ceremony at Dynamic Earth in Edinburgh on Friday evening (30 November 2018). 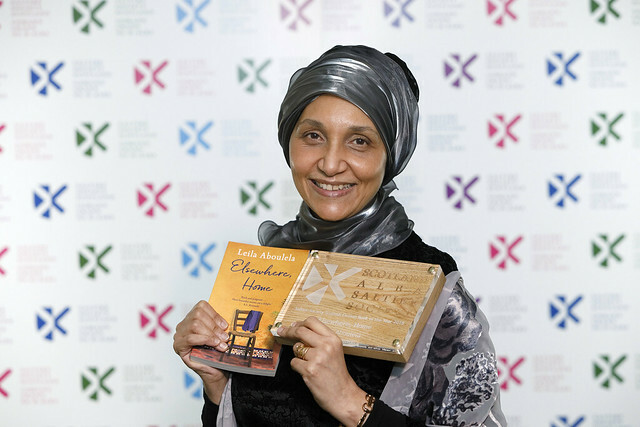 The winners of the five other book Awards announced as part of this year’s awards ceremony include Aberdeen-based Leila Aboulela’s short story collection and Fiction Book of the Year Elsewhere, Home which, through the experience of immigrants living abroad, examines the search for home in a fast-changing modern world. Charting the writer’s personal experience of cancer treatment and recovery, becoming a widow at the age of 44 and taking on the social care system on behalf of elderly relatives, Jay Whittaker’s Wristwatch was named Saltire Scottish Poetry Book of the Year. The award for Research Book of the Year went to Professor of English Literature and Book History at the University of Edinburgh Tom Mole for What the Victorians made of Romanticism, which considers how the popular media of the Victorian era sustained and transformed the reputations of Romantic writers. 2018 History Book of the Year is Islay-based writer and documentary maker Les Wilson’s The Drowned and the Saved, an extensively researched account of the sinking of US troopships Tuscania and Otranto off the coast of Islay in 1918, a tribute to those who died and an exploration of the huge impact of the disaster on survivors, rescuers and the local community. Sal, the debut novel by Fife-based writer Mick Kitson and winner of the 2018 Saltire First Book Award, tells the story of 13-year-old Sal and her 10-year-old sister Peppa who seek to escape the abuse of their alcoholic mother’s boyfriend by running away into the Scottish wilderness. Also announced at the awards ceremony was the winner of the 2018 Saltire Publisher of the Year Award with an accompanying cash prize of £1,000, which went to Edinburgh-based Canongate Books. Over the last 12 months, Canongate’s growth has seen them further develop an already strong international publishing brand. The Saltire Emerging Publisher of the Year Award went to Edinburgh-based Carolina Orloff of Charco Press in recognition of her development into an important part of publishing in Scotland in a relatively short time. Marking 30 years since the Saltire Literary Awards’ First Book Award category was established in 1988, this year’s ceremony also included the presentation of a special award for “Most Inspiring Saltire First Book Award winner”. Chosen through a public vote from a shortlist also featuring Kate Clanchy, Jackie Kay, Michel Faber, A.L. Kennedy and Ali Smith, this special award went to Glasgow-based writer Louise Welsh. Louise Welsh won the Saltire First Book Award in 2002 for her debut crime novel The Cutting Room, which subsequently went on to win the 2003 Orange Prize for Fiction. Since then, she has written seven further novels, three plays and two short story collections as well as libretto for a number of touring opera productions. Saltire Society Programme Director Sarah Mason commented: From poetry to publishing, fiction to academic studies, extending the length and breadth of the country and far beyond, this year’s Saltire Literary Awards are a testament to the outstanding calibre of modern Scottish literature in all its varied forms. Every one of the individual awards was hotly contested, making the judges’ decisions particularly challenging. My congratulations to all of the winners and my thanks to the judging panels, to all of our partners and supporters who have helped to make the 2018 Saltire Literary Awards such a resounding success. Mairi Kidd, Interim Head of Literature, Languages & Publishing at Creative Scotland, said:Creative Scotland is delighted once again to be able to support the 2018 Saltire Literary Awards. These awards occupy a unique place in the Scottish literary landscape, recognising as they do Scottish literature and publishing in all its many and varied forms. Particular congratulations to Dame Sue Black on winning Saltire Book of the Year, to Louise Welsh on her special honour marking the 30th anniversary of the First Book Award and to all of the other individual category winners in what was another very competitive year. It is great to be able to celebrate and showcase the work of everyone shortlisted and, in so doing, hopefully to promote it to a new and wider audience. and the Scottish Historical Review Trust. Find out more about the Awards and this year's shortlists HERE.